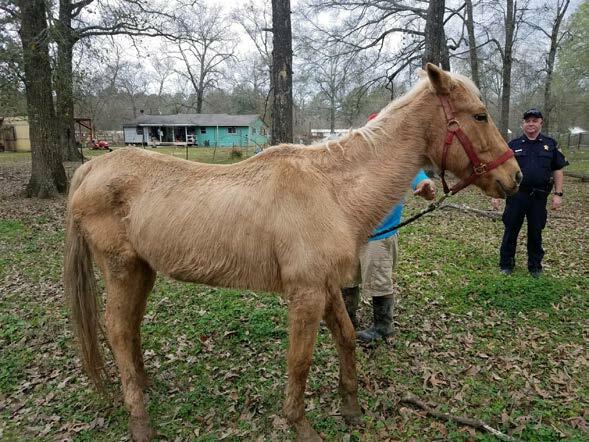 On February 6, 2019, Deputies with the Montgomery County Sheriff’s Office were dispatched to the 15600 block of W Relza Drive in Splendora Texas in reference to animal cruelty. Initial reports indicated that there were two abandoned and malnourished horses at the location. Upon arrival, Deputies observed that one of the horses had collapsed, and could no longer stand. A Montgomery County Sheriff’s Office Livestock Deputy, and representatives from the Houston Society for the Prevention of Cruelty to Animals (SPCA) were also contacted to evaluate the condition of the animals. Unfortunately, the horse that could no longer stand died shortly thereafter. A seizure warrant for the animals was obtained, and served. The living and deceased horse were removed from the property, and custody was transferred to the SPCA. The living horse will be evaluated by staff vets, and a necropsy will be performed on the deceased horse to determine why it was in the condition it was found in. Cruelty charges will be pending at the outcome of the seizure hearing.